Having your Fur Babies attend your wedding is very popular at the moment. Doggos and Puppers are such a special part of the family and more and more people are choosing to have them be present and be part of their wedding and new ‘leash on life’. 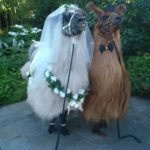 There are a few things to consider when deciding to have your pets be a part of your special day, otherwise, it can end up a bit Ruff. As weddings can be quite busy and hectic, it is a good idea to ‘paws’ and ask a friend or relative or specialised pet sitter to be in charge of your furry friend/s. These days there are even special people who will do everything on the big day to ensure your furry friends arrive on time, are looked after, fed watered and returned to their safe place after the wedding. This obviously removes the worry about their welfare. Firstly you should check that pets are allowed at the site you have chosen. They will need shade and water if it is an outside venue, especially in summer weather. Obviously, they should not be left alone in cars or to their own devices. Please give someone from your guests or your pet sitter permission to come and get the pets if they start to cause any sort of disruption to your ceremony. Like little children, pets can sometimes act out of character or in an unruly manner, and you don’t want them to spoil your big day. If they are playing a role in the ceremony, besides being in the photos or part of the wedding party, you should practice their role with them. Be realistic, do they sit still and behave if they are going to be part of the ceremony? This is a true ‘tail’ from a Cherish Wedding. Quite a few years ago, friends of mine, Lindsay and Kim, decided to a special little fur friend Rufus take the role of ‘best man and ring bearer’ at their wedding. Rufus was a very good friend of Lindsay’s and they decided to dispense with the traditional human roles of Best Man and just use Rufus. Being the smart little fellow he was, they practiced calling him at the appropriate time to come and bring the rings to the Bride and Groom. 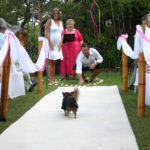 Rufus wore a doggy tuxedo with the rings attached and ran up the aisle right on cue and delivered the rings to perfection. What a good boy he was. Since those days, many couples have chosen to have their fur babies there as part of their ceremony to great acclaim. 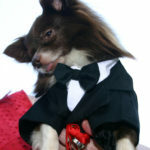 There are many websites where you can purchase some formal gear for you pet to wear at your Wedding. Otherwise, a pretty bow or some flowers attached to their collar would do the trick just right! 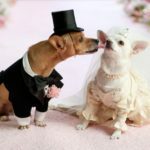 Good luck with your pet-friendly wedding and if you follow some of this advice you too will have a happy ‘tail’ to tell. Cherish Ceremonies – Creating Memories to Cherish Forever!